Hey everyone! Hope you’ve had a great weekend! This is sort of a follow-up post from the previous one where the discussion is about technology in products other than the computers and the endless stream of web marvels. The latest home theater systems are one to appreciate in this day and age as they are crowned with features that will take your breath away! Imagine using your smart phone as remote control and or being able to connect to the Internet right from your TV set to access the latest movies, music videos and much more! Sony Bravia HX820 offers just that! It has a monolithic design with integrated Wi-Fi and Skype’s Video Call functionality installed. Sony has also introduced an X-Reality PRO system which optimized video quality by compressing HD signals. This one is available in both 46 and 55 inch sets. On the other hand, competing with Sony, Panasonic also has its VIERA GT30 model which features a flush design with full HD 3D. The VIERA also has capabilities to connect to the Internet with a built-in Wi-Fi. Panasonic uses cloud-based systems that allow viewers to download HD content directly to their home theaters via the Internet. Amazing, isn’t it? ‘Smart’ TVs are in demand at the moment and such companies are making them affordable for anyone to own one! There’s a website that you can subscribe with to get all the home theater news, do check it out! Everyone knows and feels the impact of Facebook on our social lives. Facebook is the application that majority of us like spending our time on, work put aside. With millions of users able to communicate and share information with each other in real time, our love for Facebook cannot be denied. However we’re not here to talk about Facebook today, but like the title of this blog suggests: An interactive and collaborative environment for the benefit of organizations around the world, regardless of the size of the company in relation to the number of employees, or the type of organization. It is a fact that collaboration and communication are the number one key factors to make an organization successful. Without the link between different departments and employees from different levels of the hierarchy, imagine how difficult it can be to coordinate one small project and to get everyone working towards the same goal! 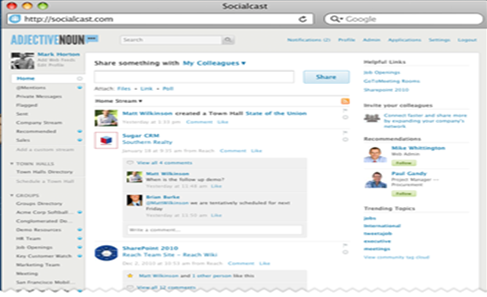 So today’s website in focus is Socialcast: An enterprise application that brings together the features and user-friendly appearance of Facebook and the microblogging trends of Twitter, put together to form the ideal solution for organizations to use to enhance collaboration between executives and employees. Business social networking is like a fun way to do work that can otherwise be boring. I have witnessed many employees accessing facebook in their working hours – Socialcast brings an application equally fun to use and most of all, it can be configured to the required work environment. The different features of the package allow organizations to enhance communication within and outside the organization, in different ways: Sharing of files, engaging in real-time, online discussions and the connection to the organization’s CRM system also gives back a competitive advantage. Enterprise 2.0 Applications are the new ‘buzzwords’ in the IT and Business sectors and Socialcast is a really good example of how technology has been integrated in the organizational field. With Socialcast, the impact of collaboration can also be measured using their Social Business Intelligence Analytics tool. And for people on the move, their organizational networks can be accessed through their smartphones as well. I reckon that at the rate of which the development of technology is catching up with other aspects of our lives, very soon we’ll all be living lives that revolve around our iPhones and Blackberries (some of us are already there..)! Lol.. Please feel free to leave comments of any other platforms you’ve come across that integrate IT with Business to provide organizational benefits.